On 11 November 2018 the world paused for a moment of silence to commemorate the end of the First World War. The solemn occasion offered people around the world an opportunity to honour the dead and pay homage to peace, freedom, and reconciliation. The theme of peace will likely continue as a prominent feature at future Remembrance Day ceremonies, as 2019 will mark the Paris Peace Conference’s centenary and 2020 will be the 75th anniversary of the Second World War’s conclusion. With that in mind, it is important to deconstruct the concept of peace and explore the often overlooked “dark side” of disarmament. Scholars have long recognized that peace is more than just the absence of war. Rather, peace is a process that means many things to different people and societies. Peace does not simply come into existence when wars end, nor is it some default condition or preprogrammed setting innate to all humanity. Instead, peace is a set of choices, actions, and strategies taken over time which are shaped by prevailing political, economic, and social factors. As a result, peace always comes at a cost, though usually its price is measured by the intensity of combat or by the number of casualties sacrificed in achieving it. However, the costs of peace can also manifest in other ways and carry disastrous ramifications for the environment. Few people realize that November 2018 and May 2020 will also mark some ominous anniversaries in the history of the world’s oceans. The exigencies of total war had forced warring nations to mobilize, manufacture, deploy, and destroy colossal human and materiel resources in battle. But when the wars ended, leftover munitions and supplies posed serious challenges. How would the victorious allies disarm their enemies, demobilize their own armed forces, and dispose of surplus materiel? Unfortunately, the proximity of the oceans offered a miracle solution. Following both world wars, hundreds of millions of tons of conventional and chemical weapons were dumped at sea. Practically every major military power adopted dumping as a primary disposal method throughout the twentieth century. The United Kingdom, the Soviet Union, and the United States dumped the largest quantities, but other countries like France, Australia, and Canada also participated. To understand why the oceans were used in such a reckless fashion requires some knowledge of the historical context and situation facing the Allies in the 1920s and 1940s. There were many factors conditioning the decision to dump munitions, but perhaps the most important was the long-established precedent of using waterways for waste disposal in urban areas. In the 19th century (and for much of recorded history), garbage, sewage, and industrial wastes were regularly dumped into the closest lakes, rivers, or oceans without regard for public health or water pollution. This attitude carried over into the early 1900s and influenced policymakers to consider the utility of oceans as both a place and means for destroying leftover ordnance after the Great War. In fact some of the first dumping grounds chosen by the British were areas already used for the disposal of muck and debris dredged up from nearby harbours. At the time, adding munitions to these long-polluted sites was not such a far-fetched idea. The attitude of government officials and scientists in the mid-20th century was another contributing factor. A common scientific belief at the time centred on the idea of “threshold values” and the diffusion powers of water. Although in the scientific community there were wide opinions on how thresholds were formed and monitored, the vast quantity of water in the oceans was viewed as a tool that could render any material harmless. At the time, the cumulative measurement of materials being thrown into the ocean did not matter as much as the individual “dosage” or the location where they were placed. Since water could repeatedly absorb the pollution, the key technical challenge was determining the maximum amount that could be dumped in one voyage without overwhelming the water’s absorption thresholds. Such calculations were supposed to protect human health or marine life, as the mixing of polluted and non-polluted waters diluted any lingering issues. In fact, whenever reports of dead or discoloured fish surfaced, policymakers usually interpreted them as evidence that dumping methods were not conforming to threshold values. Instead of recognizing an unfolding ecological catastrophe, they issued orders to better regulate the tonnage, locations, and dispersal methods. 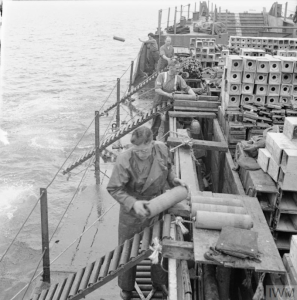 On arrival at the ammunition dumping ground off Cairnryan, near Stranraer, Wigtonshire, Scotland, members of the Royal Army Ordnance Corps (RAOC) place shells on gravity rollers that take the ammunition over the side of the ship and into the sea. Note the man in the background who is simply throwing ammunition overboard. Source: IWM, H 42208. Perhaps the most significant factor influencing the decision to dump munitions was logistics. During both world wars, governments mobilized unprecedented industrial production. The Second World War is a case in point. From 1939 to 1945, the United States produced a mind-boggling 41 billion rounds of ammunition and artillery shells, while Britain manufactured some 11 billion rounds and Canada added another 5 billion more. When the war ended, not all this ammunition was expended, in salable condition, or needed by the Allied armies, while large reserves were stockpiled across the world – from the smallest islands in the Pacific and war fronts in Europe, to magazines on the home front and everywhere in between. Moreover, the immense amount of captured enemy ordnance in Germany and Japan only added to the Allied surpluses requiring destruction. As the Second World War US film, “The Aftermath of War Production,” demonstrated, victory created a significant disposal crisis that was amplified by transportation, security, storage, and financial constraints. 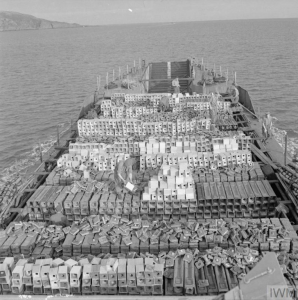 To resolve the dilemma the Allies sought solutions that would efficiently destroy lethal assets in bulk without affecting relief and demobilization timetables. In order to destroy ammunition and explosives a location of deposit and a suitable destruction method were both required. As far as contemporaries were concerned the efficiency of disposal was determined by how well these two requirements were combined. In effect, disposal was most efficient if the location where ordnance was placed was the destruction method. The oceans fit the bill. They limited the need for land-based storage as the water formed a natural security barrier that reduced financial costs, the potential of recovery, and allowed for the disposal of bulk quantities. These were important considerations given the devastated transportation networks in Europe and Asia, the available surpluses in Allied shipping capacity, and the distribution of weaponry across the world. Additionally, dumping meant that objects were thrown overboard as a whole or in parts which negated the need for extensive mutilation at the rudimentary demilitarization facilities popping up around the world. This greatly expedited the disarmament process which ensured that it kept pace with troop demobilization, postwar reconstruction, and peace treaty negotiations. Throughout the Cold War, the precedents of earlier decisions and actions predisposed new generations of military and political officials to the utility of ocean dumping and helped entrench it as a primary disposal method. However, there was one key contextual difference to dumping in the 1950s and 1960s that was not totally present in the aftermath of the world wars. Dumping munitions had evolved from supporting peace and disarmament processes to keeping pace with the military-industrial complex and its insatiable appetite for planned obsolescence. The decades after the Second World War were an age of immense scientific and technological progress in weapons design. When each new marvelous gadget was introduced, it rendered something else in the military’s arsenal obsolete. Ocean dumping offered the most efficient disposal method for the items that could not be scrapped for parts or sold to friendly governments. Thus, during the Cold War, the dumping of munitions came to facilitate the perpetual rearmament of military forces. Map of Beaufort’s Dyke Explosive Disposal Site. Note that the pipeline transects the dumpsite. 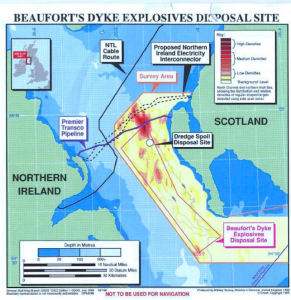 Source: “Beaufort’s Dyke Explosive Disposal Site,” from the “Disposal of Munitions at Sea” webpage, Ministry of Defense (UK), 2008 (last updated 2012, accessed 30 November 2018). In the final reckoning, limited ecological literacy and the sheer size of leftover stockpiles prompted military authorities to take advantage of the oceans. The vast expanse of open water and the sea floor’s relative inaccessibility were indispensable tools for implementing disarmament and peacemaking. However, ocean dumping did not eliminate the cargo’s destructive nature. Instead, as Astrida Neimanis explained, underwater munitions exist in suspended temporalities; their deadly nature is delayed and dispersed across space and time. These submerged time-bombs are what Rob Nixon has called “slow violence” or violence that is attritional and gradually occurring without a spectacle or direct causality. Out of sight and mind, corroded shells now threaten marine ecosystems and human health with heavy metals, toxic chemicals, and carcinogens, while TNT and mustard gas regularly wash up on coastlines around the world. Old dumpsites, like Beaufort’s Dyke in the Irish Sea, remain dangerous obstacles to offshore economic development in the fisheries, energy, transportation, and tourist sectors. Long after the Armistice and peace treaties were signed, the dark legacies of disarmament persist in marine environments, as the tools of death and destruction slowly return to endanger future generations. Corroding shells off the coast of Nova Scotia, Canada. 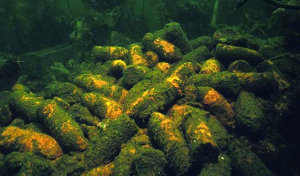 Image courtesy of International Dialogue on Underwater Munitions. Dr. Alex Souchen is a former SSHRC Postdoctoral Fellow at the Laurier Centre for Military Strategic and Disarmament Studies and currently teaches as a sessional instructor at Conestoga College and Western University. He also works part-time for the International Dialogue on Underwater Munitions. His first book, Tools of Peace: Munitions Disposal, Postwar Reconstruction, and the Canadian State 1943-1948, is currently under peer review. Antony Adolf, Peace: A World History (Cambridge: Polity Press, 2009), 1-11. For examples, see: J. Beddington and A. J. Kinloch, Munitions Dumped at Sea: A Literature Review (London: Imperial College Consultants, 2005), 1-90; David M. Bearden, U.S. Disposal of Chemical Weapons in the Ocean: Background and Issues for Congress (Washington: Congressional Research Service, 2007), 1-22; CHEMSEA Findings: Results from the CHEMSEA Project – Chemical Munitions Search and Assessment (Gdansk: Institute of Oceanology of the Polish Academy of Sciences, 2013), 1-88. The National Archives (TNA), MAF 209/3013, “Extract from Ministry of Agriculture and Fisheries Report on Sea Fisheries for the Years 1919, 1920, 1921, 1922, and 1923: The Disposal of Surplus Ammunition,” 1. Jacob Darwin Hamblin, Poison in the Well: Radioactive Waste in the Oceans at the Dawn of the Nuclear Age, (Piscataway: Rutgers University Press, 2009), 10-38. TNA, MUN 4/6046, “Conference with the Oyster Merchants and Planters Association on the Dumping of Waste Explosives,” 26 September 1921, 1-6; Alex Souchen, “Something fishy? underwater munitions and unexplained die offs in marine environments,” International Journal of Maritime History Vol. 30, No. 2 (2018): 355-61. Arthur Herman, Freedom’s Forge: How American Business Produced Victory in World War II (New York: Random House, 2012), iv and 335; David Edgerton, Britain’s War Machine: Weapons, Resources and Experts in the Second World War (London: Penguin Books, 2012), 274-276; Jeffrey Keshen, Saints, Sinners, and Soldiers: Canada’s Second World War (Vancouver: UBC Press, 2004), 42-43. Astrida Neimanis, “Queer Times and Chemical Weapons, Suspended in the Gotland Deep,” Journal of Contemporary Archaeology, Vol. 5 No. 1 (2018): 66-78; Rob Nixon, Slow Violence and the Environmentalism of the Poor (Cambridge: Harvard University Press, 2011), 1-44.